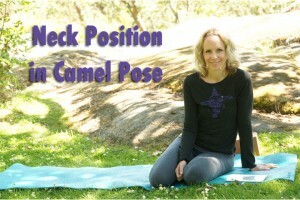 What is the best position for the head and neck when doing Camel Pose? This is a question of what feels better in your body. You can elongate your neck if it feels alright in your neck and you are not hyper-extending your neck (as long as it goes with the natural curve of your spine). Often camel is taught with a tucked chin because so many people have neck issues and this is a nice way to keep your neck safe if there are any neck issues. See what feels best in your body.